This gorgeous home offers 5 bedroom and 3.5 baths. Bedrooms are nicely spaced offering 3 distinct private areas. Super for families or adults traveling together. 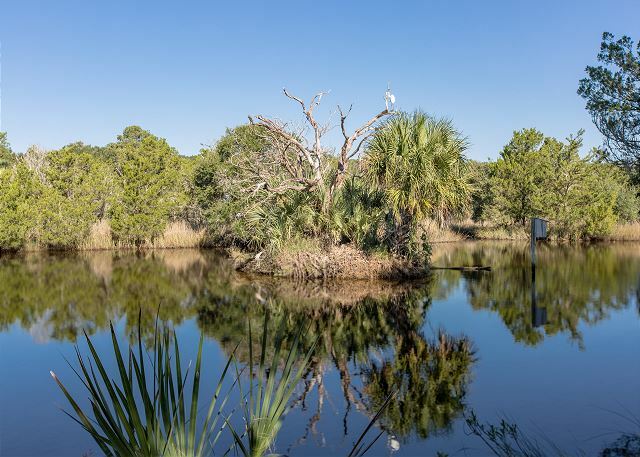 Home is near the beach and situated on a long, lagoon offering water views from many rooms. Living areas and kitchen feature hardwood floors. Kitchen with Corian counters opens to the dining area. Master suite is located on the first level with access to the back deck. Additional bedrooms are located on upstairs levels. Garage not available for guest use. Wireless internet available for guest use. Many TVs and DVD or VCRs. Kid's playroom too! We booked this trip last minute and it was one of the few houses that allowed dogs. It ended up to be the perfect place for us! The house was well equipped, much larger than we even expected and we loved the floor plan which made it feel like there were separate wings to the home. We were one family but it would be perfect for 2 or even 3 small families traveling together. There were tons of movies and games which was a nice addition. The location was awesome. We loved having the deck with the gate so the dog could be out without worrying about her getting too close to the water. The yard was a nice addition. We felt like we were in our own private park yet close to the beach access. We could even hear the waves a few windy nights. Pam Harrington were wonderful. Be sure to check out the Irish Pub at the marina. We hope to come back again someday! Wonderful memories made again at Seabrook! We had a wonderful time celebrating our son's wedding and vacationing at Seabrook. The house was perfect for us and the two couples that joined us. The upstairs seperate bedrooms were ideal for our guests. I’ve had a great experience and week at this house. 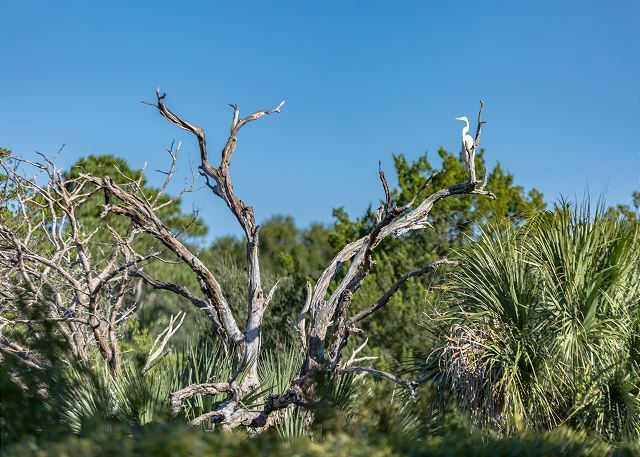 It was our first stay at Seabrook Island and we couldn’t have loved it enough. Seabrook Exclusives made renting so easy, they were very user friendly, always answered our rental questions and communicated great so we didn’t skip any steps getting into our house the day of check in. The house itself was perfect for 3 families sharing for the week. We also had two dogs. Lots of privacy and our small kids loved the playroom. Seabrook Exclusives was simple to work with before, during and after our stay. Communication was prompt and courteous, house looked exactly as pictured and all details were taken care of as promised. Will be using this group again and would highly recommend. 3501 was a lovely retreat. The home is large and comfortable both inside and out. The house provides easy access to the beach for long walks looking at the beautiful Oceanfront mansions. There were 4 adults and 2 dogs in our party and all had space to spread out as well as get together for meals and games at the dining room table. The house is not fancy but a great beach home to relax and enjoy nature in. thanks to the management team for responding immediately to our internet issue and correcting it. They also provided enough "starter" supplies that we didn't need anything but food! The house was great. Well furnished, comfortable beds, well equipped kitchen, nice view from LR and deck over the back yard to the lagoon and fairway. A little walk to the beach but not bad. Well designed layout with good privacy for BRs #2&3 and BRs 4&5 with shared baths in each area. Felt like separate private wings. Wonderful Time!! House was Great!! he house was just perfect and very clean. It was in walking distance of the beach. I loved being able to take our dog. We had 3 families staying in one house and it was perfect! We had large living areas and seperate room wing areas that made it feel like we all had our own space inside a big house. Pet friendly was a plus! This was our fourth time in 8 years (come every other year) so it felt like "home". Wonderful location (relatively close to pool walkway) with a great pond out back. Overall safety of the house and surrounding area was ideal. Lots of shade...toys for children and games for adults. Clean and welcoming and maintenance quick to respond to needs. Like new access via lock box and Wifi was essential to our family. Look forward to next time!!! We spent a great week at 3501 Seabrook Island Road! The house is very comfortable for 8 adults and 3 children. Sleeping arrangements were great. We rented bicycles for the week and rode to the beach every day on Oyster Catcher Road - very convenient to the house. Overall our week was great! 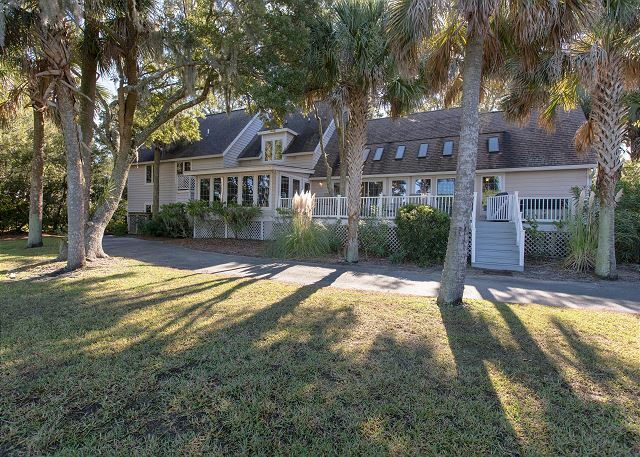 This 5-bedroom house has everything a family or multi-family vacationer can expect. Location is awesome - close to golf, pool and beach. Amenities galore - outside deck, furniture, new BBQ as well as general household items. Property management company gets a consistent AAA+ for having property ready, clean and check-up regularly for your vacation enjoyment and needs. Our family traveled from VA to meet our daughter, son in-law and grandsons traveling from FL. It was a perfect destination for all of us. We had plenty of room and loved the scenery. It was a real treat to have as many as six deer at a time visit us on our driveway. I have some great photos as well. Great house, great location. Perfect for our family reunion. We especially liked the fact that we had 3 separate sleep areas and plenty of room to spread out for things like crafts, reading, TV viewing, etc. Perfect for families or friends. Very kid-friendly. Short walk to beach. My family was very happy and impressed with the house and location. It was the best vacation ever! Will return again. Our family had a wonderful stay at this home. The house is very spacious and is centrally located within the Seabrook community. We rented bikes and conveniently rode to most places even Freshfield village! We had 3 families staying and the house was so well laid out we did not keep running into each other. Nice kitchen with lots of pots and pans. Large back porch overlooking the lagoon where we gathered every night. Property was clean and well maintained. The property management was very helpful and courteous!! We will definitely come back. We had a wonderful week in this house. It is a great fit for a family and our 6 year old particularly enjoyed the playroom with all of the toys! It was an easy walk to the beach and an easy bike ride to the pool. The house could use some minor updating--one of the kitchen cabinet doors actually fell off in my hand the first time I opened it. Fortunately my husband was easily able to screw it back in. My 6 year old also really enjoyed riding his bike on the paved circle that goes around the drive to the back of the house. We saw lots of nature--a mom and baby deer in the yard one evening and alligators in the lagoon out back twice! It is not the fanciest beach house I have ever rented, but it is roomy, comfortable, and conveniently located. Our stay at 3501 was awesome!!! Loved our stay at 3501! We have owned an atrium in Seabrook for 10 years. This summer we rented a house to fit our family and extended family. The age range was 1 to 80 and dogs! 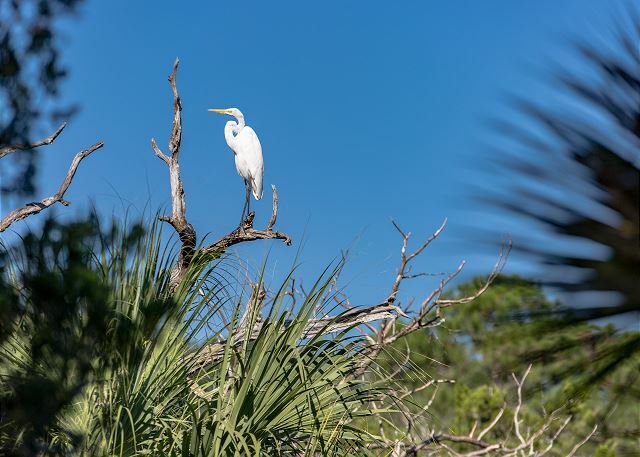 It was a different experience for us and we spent the beach days at North Beach, the community pool and loved being able to cook out on the large deck and enjoy the great view of the lagoon and wildlife along with all our other favorite spots. We love Seabrook! House was roomy, well equipped. TVs in every bedroom. Extra living room, playroom. Great parking. Comfortable beds. The family that owns it really had lots of extras - games, toys, movies. Perfect for us and would stay there again. We loved Seabrook, as always, and our stay at 3501. Simple and well lived-in, lots of space, well-equipped and well located. Wonderful, peaceful deck. Would rent this house again. Fabulous place to stay when traveling with multiple families and pet! When everyone says "they want to come back to THIS house" you've got it right! Sleep areas are spread out in three separate zones giving privacy. The kids loved the playroom and games that were provided. Books and DVD's are great if you catch a rainy day. The kitchen was adequately supplied. The house could stand a few more towels if 10 people are present, but that’s something a couple of loads of laundry takes care of! As the house is tucked back off the street and is heavily treed, the wildlife is amazing. Deer come right up to the deck and fortunately the alligator stayed in the lagoon. Everyone enjoyed seeing it surface and the fish jump to avoid it. The house is just a short walk to the beach. While it is pet friendly there were no signs or smells of previous pets. A deck gate allows your 4 legged friend (and children) freedom on the deck without worries of them venturing into the yard. When returning to the island we will stay there again! It was a great home for our group of 8. Short walk to the beach with beautiful views from the deck. We had a wonderful Thanksgiving week. The house was well appointed, clean and comfortable. There was plenty of room for the entire family, 9 in all. The community was beautiful with every amenity you could ask for. The Thanksgiving buffet was out of this world. Seabrook Exclusives was wonderful to deal with and made our stay smooth. When the coffee maker wasn't working it was replaced immediately. The only issue was the number of towels and wash cloths, though there was plenty of laundry soap to wash them as needed..
We would definitely stay here and would definitely book with Seabrook Exclusive again! Property was everything promised. We had a wonderful extended family get together and loved the property. It was perfect for our large family. 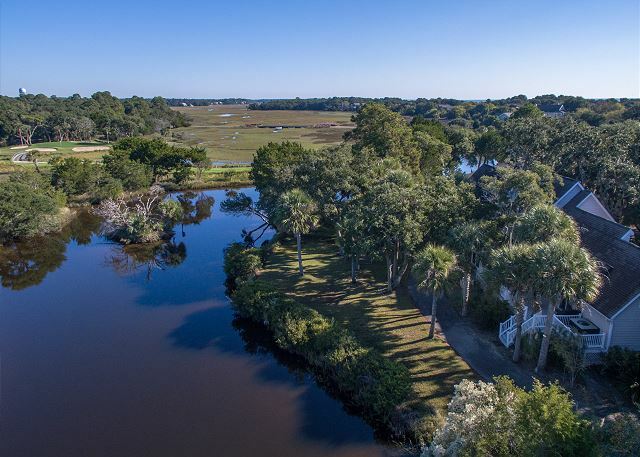 3501 Seabrook Island Road has an excellent layout, in an excellent location. The condition of the house and its eqipment, however, needs some work. We had to call for repairs to the disposal (twice) and the dryer (once). In addition, the phone in the kitchen did not work (since we arrived on the weekend, we simply bought a cheap phone to use). The bathroms need towel racks, and the Livingroom needs more lighting in order to read. Otherwise, however, we had an excellent stay; the house is great for guests, and we offer our comments only in the way of constructive criticism. We would definitely rent the house again if we needed large, expansive living areas. Our stay was everything we expected. The property manager was very attentative and addressed all our concerns immediately. The house was very nice and was set up for my entire family with 4 yr old twins and week old baby. Having separate areas was good. The kids play room fully stocked gave the girls plenty of thing to do. I would stay there again. Perfect layout for a family but needs maintenance & repairs. The home was clean & spacious but needs some attention in terms of upkeep. The furnishings & interior could use some updating. Upon arriving we found the wi fi & phone to be out of order, as well as the family room TV/DVD. The dryer quit working midway through our 2-week stay. The staff at Seabrook Exclusives were extremely responsive & had the repairs made promptly. We were pleased with their efforts. The home is very spacious with an open kitchen/living space. There is a wonderful playroom for younger kids, the sleeping areas provide privacy & quiet for large families or groups. The place was well stocked with games, DVDs and kitchenware. However, there were no beach towels, beach chairs, etc to use. This has not been the case at other properties we've rented at Seabrook. We really enjoyed the outdoor deck areas with the beautiful lagoon. We spotted two alligators! The deck & furniture could use some maintenance as well. 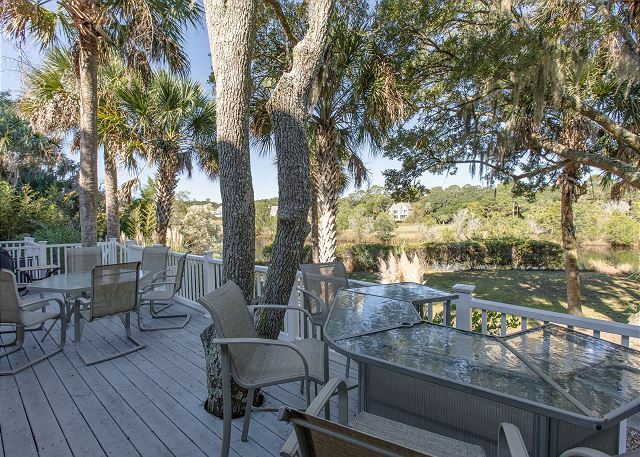 Overall, we had a fantastic 2-week stay at Seabrook & would probably rent this property again. We were just a bit disappointed for the price, especially compared to other places we've stayed. We have made 8 trips to Seabrook in 6 years & expected a bit more. The layout, deck areas & lagoon make up for some other flaws, though. We did enjoy our stay at 3501 Seabrook Island Road. The location was great for easy access to ocean and pools. We had a perfect shady location for viewing the 4th of July parade. Our house was missing our 2 beach chairs but these were delivered by staff at Seabrook Exclusives which we appreciated greatly. We loved the separate bedroom wings and the play room for kids. Our only complaint would be the louvered doors to the bedrooms. We had a very active and vocal 20 month old and the noise of his early morning antics easily carried through to all the bedrooms. We love Seabrook and will definitely come back. Thank you! We had a great time - a great house for a family with kids. Large rooms, fully supplied kitchen, large balcony overlooking lagoon. Not far from the beach and pool - but too far to walk. One great advantage was that the pool and the beach access were very close - so you can go to the pool and then later walk to the beach without having to move by car. The rental staff were very attentive - when the microwave broke, they provided a loaner within a couple of hours. We would go there again. The only downside was that noise from downstairs carried to the upstairs very easily - so if some stayed up late, it disturbed the sleepers. from the UK and had to spend time buying the basics which really could have been provided. My adult siblings & I rented this house for a week over Christmas. It surpassed our expectations in every way - location, condition, size, amenities. Loved it - thank you! Overall a nice stay, so no complaints here, just suggestions. Could use a thorough cleaning (underneath sofa and chairs, etc), some paint work, and new bed linens and blankets. We had to replace two smoke alarm batteries to prevent constant beeping. Too many locked doors for owner storage, ino access to garage and no pantry available to store groceries. 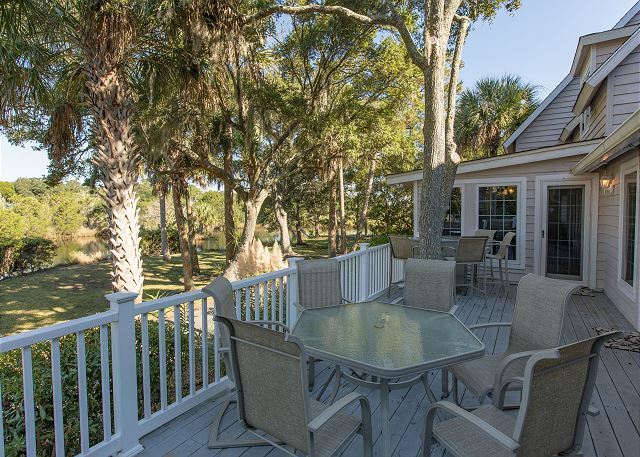 We have been vacationing at Seabrook Island for 20 years and this was one of our favorite properties. The kids enjoyed fishing in the pond directly behind the house. The layout of the home made it ideal for 2 families.The home was clean and well maintained and we appreciated the large selection of books the homeowner has. We certainly hope to stay in this property again.